Chateau d’Armailhac was previously part of their massive vineyards that we know of today as Chateau Mouton Rothschild. The name of the estate came from one of the first owners of the estate, Dominique d’Armailhacq. During the late 1600’s, the d’ Armailhacq brothers earned their living as river boat captains on the Gironde estuary. It was at that point in time they began purchasing land in Pauillac. The d’Armailhacq family, who got their start in the Bordeaux wine trade continued to own the estate until 1843, when the family had fallen deeply into debt and was forced to sell a portion of their property to satisfy their debt. It was obvious to people in Pauillac at the time the owners of the estate, the d’Armailhacq family needed funds, all they had to do was look at the chateau. The family began to build the chateau in 1820. 10 years later, the slow construction ground to a halt as they could not afford to finish it. For some unknown reason, which may have eventually turned into a tradition, the building was never completed, leaving only half the chateau completed, making what later became Chateau d’Armailhac, one of the more interesting chateau to visit in modern times. It is thought that Chateau d’Armailhac was one of the first produces to begin planting large portions of Cabernet Sauvignon and Merlot in their Left Bank vineyards. Eventually the d’Armailhacq family sold the estate to the Ferrand family who in turn sold it to the young, and soon to be famous Baron Rothschild. For the Baron, this was an important purchase as Chateau d’Armailhac was located right next to Chateau Mouton Rothschild. This purchase allowed Mouton Rothschild to expand their holdings in Pauillac. As part of the deal, Count Ferrand was allowed to remain in residence at Chateau d’Armailhac for the rest of his life, rent free. In reciprocity, Baron Philippe Rothschild also took over the Bordeaux trading arm of Chateau d’Armailhac, which allowed the Baron to begin producing and marketing this first branded wine, Mouton Cadet. When the Medoc property was purchased by the Baron in 1934, it was known as Chateau Mouton d’Armailhacq. It was the Baron who changed the name to Chateau d’Armailhac. To honor his recently deceased wife Pauline, in 1976, the label included “En hommage a Pauline”, for that single vintage. In 1989, the label was changed to the name we know the wine as today, Chateau d’Armailhac. In 2006, Philippine de Rothschild added to their holdings with the purchase of 24 hectares of vines belonging to Chateau Colombier Monpelou that was owned by Bernard Jugla. Part of the purchase agreement was that the technical team of Mouton Rothschild continue making the wine under the name of Chateau Colombier Monpelou until 2015. From that point forward, it is expected that most of those vines will be added to the vineyards of Chateau d’Armailhac. Chateau d’Armailhac is not the only Fifth Growth Pauillac vineyard in the Rothschild family holdings. In 1970, they purchased Chateau Clerc Milon. The 50.9 hectare Pauillac vineyard of Chateau d’Armailhac is planted to 56% Cabernet Sauvignon, 22% Merlot, 20% Cabernet Franc and 2% Petit Verdot. The majority of the Chateau d’Armailhac vineyard is shaped like a T, with a few scattered parcels in and around Chateau Pontet Canet. The vineyard can be divided into two parts, with about half the vines placed south of the chateau, while the remaining vines sit due west, close to Mouton Rothschild. To the east, the vineyard abuts Chateau Pedesclaux. The vineyard has a vine density of 8,500 vines per hectare. The vines are old. In fact, some of the oldest vines in the Medoc are at Chateau d’Armailhac. Close to 20% of their entire vineyard is more than 125 years of age with plantings dating back to 1890! These are some of the oldest vines in all of Bordeaux. Many of those old vines are Cabernet Franc. As those vines die, they are replaced with Cabernet Sauvignon, which is a better fit for their vineyard. The terroir is mostly gravel with sand, clay and limestone soil. 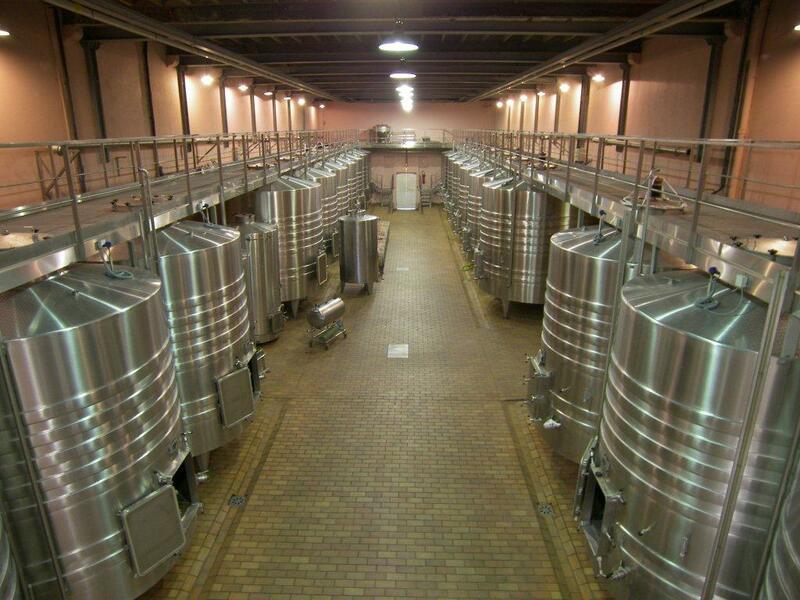 To produce the wine of Chateau d’Armailhac, the wine is vinified in temperature controlled, stainless steel tanks. 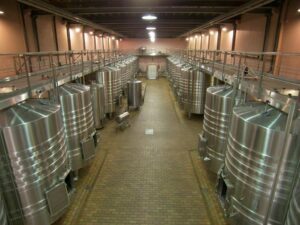 Malolactic fermentation takes place in tank. The wine of Chateau d’Armailhac is aged in 30% new, French oak barrels for an average of 16 months. The production of Chateau d’Armailhac is on average close to 18,000 cases per year. Chateau d’Armailhac offers good value, drinks well young and shows good, solid, Pauillac character. The original porcelain artwork the logo is based on, resides in the museum at Chateau Mouton Rothschild. The best vintages of Chateau d’Armailhac are: 2018, 2017, 2016, 2015, 2014, 2012, 2010, 2009, 2006, 2005, 2003 and 2000. Older vintages have not aged that well. I would probably not look for those wins today. Instead, I’d focus on the much better, younger, more interesting vintages. Chateau d’Armailhac was for years thought of as a lighter styled, early drinking Bordeaux wine. Today, d’Armailhac expresses ample Pauillac character with good concentration of flavors and supple textures. 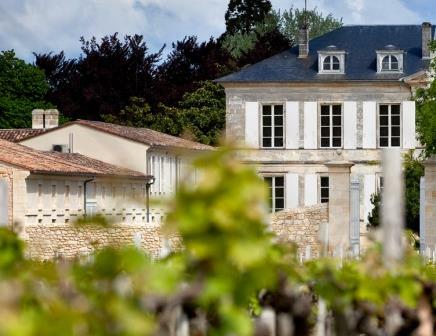 Hopefully, this trend to producing better Bordeaux wine at this property will continue. 2009 is the finest young vintage of Chateau d’Armailhac I’ve ever tasted. Although, while 2010 d’Armailhac is different in style, it is not that far from the 2009 in terms of quality. Chateau d’Armailhac can be enjoyed on the young side with a few hours of air. But I find it too tannic to enjoy without cellaring. The wine is most often best with 8-12 years of bottle age. Of course that can vary slightly, depending on the vintage character. In the best vintages, the wine will be at its best between 10-25 years of age after the vintage. Young vintages can be decanted for an average of 2-3 hours, give or take. This allows the wine to soften and open its perfume. Older vintages might need very little decanting, just enough to remove the sediment. Chateau d’Armailhac is best served at 15.5 degrees Celsius, 60 degrees Fahrenheit.The cool, almost cellar temperature gives the wine more freshness and lift. Chateau d’Armailhac is best served with all types of classic meat dishes, veal, pork, beef, lamb, duck, game, roast chicken, roasted, braised and grilled dishes. Chateau d’Armailhac is also good with Asian dishes, hearty fish courses like tuna, mushrooms and pasta. The opening act is black fruit, juicy plums, smoke and just a tip of licorice in the background. Intermission finds soft, fresh, sweet blackberries while a salty minerality lingers in the wings. The wine is a blend of 68% Cabernet Sauvignon, 22% Merlot, 7% Cabernet Franc and 3% Petit Verdot. The harvest took place from September 6 to September 29. Black cherries are all over the place. The fruit is fresh, juicy and long with cocoa and spicy plum scents. The wine has lift, the fruit is sweet and soft, This is the best wine ever made at the property. Medium/full bodied, soft, polished, sweet, dark red fruits, with freshness, ripe tannins and a tobacco, cedary edge to the nose. Black cherry, cocoa, flowers and spicy plum aromas create the nose. On the palate, the wine is fresh, sweet and silky. The tannins are soft and the fruit feels good as it sticks on your palate. Medium/full bodied, long and harmonious, this is easily the best wine ever made at the property. Produced by blending 62% Cabernet Sauvignon, 28% Merlot, 0.8% Cabernet Franc and 0.2% Petit Verdot, this wine reached 13.4% alcohol. The harvest took place September 27 to October 14. Soft, silky, forward and medium bodied, there is verve, sweet fruit and lift. The wine remains focused on earthy nuances, dark red fruits, cassis, spice and licorice. You can age this for 7-10 years before popping a cork. Soft, smooth and on the way to silky, the wine is medium bodied, forward, and already open to sharing its earthy, ripe, dark red fruits, cassis, spice and tobacco character. The finish combines freshness with round, soft tannins and juicy, dark red fruits. Scoring at the top my range, or even higher will be easy for this wine. It is ripe, juicy, concentrated and fresh, finishing with an earthy blast of tobacco tinged, cassis and blackberry. Solid wine this year, with a spicy, dark, red berry nose, complicated by tobacco and earthy aromatics. Medium/full bodied with freshness, finesse and refined, ripe, sweet fruits in the finish. With a sharp, cassis, cranberry and tobacco infused character, the wine is medium bodied, and finishes with light, bright, red fruits. Forward, soft and expressive, the medium-bodied wine is all about the fresh, clean, peppery, red fruits and spicy nuances. Not a long distance runner, drink this over the next 10-12 years for maximum enjoyment. Soft, round, forward, medium bodied with a fresh cassis and tobacco filled personality. The bottle was decanted about one hour in advance of the tasting. Soft, round, forward, medium bodied with a fresh cassis filled personality. Very floral, with black cherry, cocoa, blackberry and earthy scents rounding out the perfume. The soft, easy to like and drink style is very good for the vintage. This is getting close to its prime-time window, that I suspect will hit in the next few years, the wine is juicy, fresh, sweet, and loaded with bright, red fruits, tobacco and spicy characteristics with soft textured, ripe tannins. This just keeps getting better and better. The purity of the fruit, freshness, balance and elegance is starting to wake up. Give it a few more years. Another nice showing for this well-priced Pauillac. Lots of fresh dark berries, cassis, cedar and tobacco, soft textures and a fresh, crisp, refined finish. Some time in the cellar will be god for this wine. Smoke, blackberry, tobacco leaf and spicy cassis notes pop with little effort. Tannic, refined and concentrated, the wine is structured to age, ending with fresh, pure, crunchy cassis. Mineral, smoke, tobacco and blackberry scents lead to an elegant Pauillac with a lush, soft, forward, black plum filled finish. Give this a few years before popping a bottle, it will add complexity and more finesse. Pure cassis, gravel, dark berries and earthy aromas lead to a plush, fresh, chewy Pauillac. From an assemblage of 60% Cabernet Sauvignon, 24% Merlot, 14% Cabernet Franc and 2% Petit Verdot, the wine is medium/full bodied with plush textures and ripe tannins. Graceful and elegant, the wine ends with good concentration of fruit and sweet cassis flavors. Herbal, minty and leafy with red fruits, medium body and a salty, red berry finish. The wine is a bit strict and the tannins stand out. Give it a few more years for the wine to soften and fill out. Produced in a light and polite style, with cassis, cranberry and spice in the nose, this medium bodied Pauillac does not have the level of concentration found in the beautiful 2009 or 2010. It's a correctly made Pauillac, it's just a little light. It should drink well young. This medium bodied Bordeaux wine offers tobacco, earth and cherry notes in the perfume. Light in style, the wine shows some green flavors in the finish. Similar to Clerc Milon, the strong 2009 d'Armahillac remains the wine to buy. It's probably the best wine the property has ever produced. It's also one of the best values from the Medoc in an expensive vintage. A solid example of classic Bordeaux, with its medium bodied, expression of fresh, bright, red fruits, wet earth, tobacco, cedar and cigar wrapper. The tannins have a nice polish that adds to the soft, easy to like, red berry finish. This is very strong for the vintage. Forest, old wood, cigar box and cedar notes are easy to find This is fully mature, and drinking in the sweet spot. Medium bodied, fresh and offering its cassis and cedar profile in the finish. This is the first vintage made in the estate's new gravity based cellar system. Chocolate mint, cassis, tobacco and fresh cherries open to a medium bodied Pauillac that is rapidly approaching maturity. With aromas of cedar wood, tobacco, blackberry, earth and spice, the wine is already developing well and showing its open, cassis fueled, elegant fresh, Pauillac, charm. This is developing nicely. With a nose filled with cedar wood, cassis, oak, lead pencil and hints of tobacco, this is all about Pauillac. Soft and round in texture, while this lacks the density found in the top wines, it also lacks the high price tag. Produced from a blend of 60% Cabernet Sauvignon, 29% Merlot, 10% Cabernet Franc and 1% Petit Verdot, this is a Left Bank Bordeaux wine that you can drink now and over the next 12-15 years. Cedar wood, peppery berries and cassis in character, another year or two could add some softness to the sandy tannins in the blackberry and cranberry end notes. Light in color, with advanced aromatics, this lighter style of Pauillac offers spicy cassis, cranberry, earth and tobacco. Already close to mature, this wine is best enjoyed over the next 6-10 years. From a blend of 65% Cabernet Sauvignon, 20% Merlot, 13% Cabernet Franc and 2%Petit Verdot, this medium bodied, round, ripe, blackberry, cedar wood, tobacco and earth infused wine is ready to drink. Drinking well with about an hour of air, this blend of 70% Cabernet Sauvignon, 22% Merlot, 5% Cabernet Franc and 3% Petit Verdot offers a classically styled, cassis and blackberry, tobacco and herb profile, with a round texture with only a minor hint of greeness in the otherwise, dark, red plum finish. Light, bright, medium bodied, mature, soft textured and focused on cassis, cranberry, cherry and tobacco notes, the wine is pleasant, but not exciting. Mature, soft, easy drinking Pauillac with a tobacco, cassis and earthy, forest character. This requires drinking as it's not meant to age much after this point. Offering secondary notes of tobacco, earth and truffle. This medium bodied wine did not seem fully ripe. The flavors in the finish edged to the red fruit side. Dark red tea in color, with strawberry and earthy aromas, this medium bodied Pauillac ends with green peppercorn and cherry flavors. This lighter style of Bordeaux wine is past fully mature. Firm, almost strict in character, with a tannic spine that never faded. The wine is medium bodied, with crisp, sharp, red berries, tobacco, cedar and wet earth characteristics. The wine is much better on the nose on the nose than the medium bodied, austere palate. At 20 years of age, this is not going to improve from here. Brick and tea in color, with a pleasant nose of cedar, leaves, earth, forest floor and tobacco notes. Not much fruit remains, what there is was on the tart, cranberry, spicy side of the style range.